The Soviets roll initiative for the afternoon and immediately set off to take out those pesky Israeli patrol boats. The Turks have declared war on the Russians already and will be in the game from tomorrow so there's no need for the Soviets to tread gingerly. 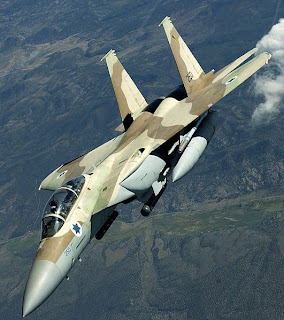 They immediately send off three squadrons of T-16 bombers to fly from the Crimea south through Turkey and into the Eastern Med, where they promptly and easily dispatch three flotillas of Israeli patrol boats. Mark H. Walker kindly made "Birds of Prey", a bonus pre-order scenario for Band of Heroes. available for all to play last week. You can download it from here. In this scenario, the 101st Airborne meets up with the German Fallschirmjager patrolling the area near Carentan on June 11th, 1944. It's an infantry-only scenario that lasts six turns so it's a great introduction to the LnL system, not to mention a nicely designed match-up between elite American and German units. The Americans get six 2-5-4 squads with a couple of Satchel Charges and some BAR automatic rifles while the Germans get 6 units and some machine guns to match the Americans pound for pound. Victory conditions are determined by number of buildings held by the end of the scenario as well as eliminated units. Since the setup involves each player alternating their unit placement, things are off to a chaotic and unpredictable start. I've wanted to write an ongoing AAR of an advanced scenario in Sixth Fleet so I thought I would start it up today and just sort of play and update it when I get a chance. Things are getting busy for me at work so I'm not sure how often I can update the blog but I'll do my best. I'm going to play a "short" scenario with all the bells and whistles. Since there's no way I can justify using the table space for a prolonged period, I'm going to be using Vassal to play the game. So in this scenario, the Syrians have attacked the Israelis and the political situation is very confused. The Soviets have deployed to the Mediterranean and are causing problems and the US is trying to keep open the sea lanes from the Atlantic to Israel. I'm going to choose a "Low Preparedness" level for both sides. This makes it slightly less work to set up the game and, given the scenario description, it just seems like the right way to go. Captain McCloud looked north towards the small town of Wolfheze nervously. It was his charge to keep it in British hands now. But somewhere out to the east were German tanks and men advancing straight for them. If the British 10th Para could not hold the small town, the Germans would soon march into Arnhem and reclaim it, reversing all the hard British efforts of the past 3 days.